This Amish made Plymouth arbor is made of 100% vinyl material which is low maintenance. 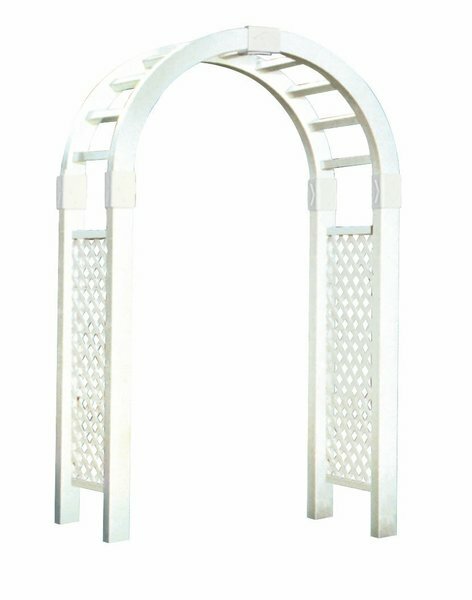 This garden arbor is blow-molded with vinyl which is know for its strength and maximum resistance to fading. The walls of the arbor post are.120” thick, rails are .110” thick, and spindles are .080” thick. The posts in this arbor are 4” x 4”. The arbor is held into place with aluminum ground anchors, which are included with the arbor. The Amish craftsmanship of this arbor is outstanding, right down to the finest detail. You can choose to order this arbor with an optional garden bench if you want a spot to sit and relax in your garden. This Plymouth arbor come with a manufacturer’s lifetime warranty, which demonstrates pride and confidence in our products.